In 1984 A.H. and A.W. Reed published my book Collecting Antique Bottles in New Zealand - A guide for beginners. Chief Editor Paul Bradwell was enthusiastic about the project and had 2,500 copies printed. These all sold out in about eight weeks and a new hobby was launched in this... read full description below. In 1984 A.H. and A.W. 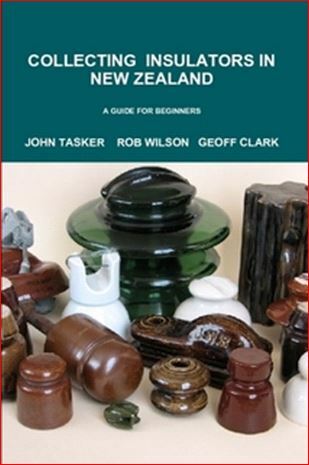 Reed published my book Collecting Antique Bottles in New Zealand - A guide for beginners. Chief Editor Paul Bradwell was enthusiastic about the project and had 2,500 copies printed. These all sold out in about eight weeks and a new hobby was launched in this country. Now I'm doing it again. This present book deals with a new hobby taking off around the world and just beginning to gain a toehold here. But this volume is more than just a collector's handbook or catalogue. It is also a social history, dealing extensively with the introduction of telegraph and phone systems in New Zealand from the late 1860s onward and with power reticulation just over 100 years ago. And all the problems associated with both. In 1984 libraries around the country played a big part in both the quick placement of the books, and the establishment of a new hobby. I'm hoping for a repeat performance. You can still find one or two of my bottle books on the shelves of most libraries today. What I'm asking now for is that you put as many copies of this present volume on to library shelves as possible and watch how popular they become over a period.